When someone walks into this place for the first time, he/she cannot help but notice what is at the center of this sanctuary. What is it? Is it an altar? Or is it a table? I am not just nitpicking. What we call it probably reflects our understanding of what goes on here when we gather for worship. There are dramatically different understandings of it within the Christian Church. The gigantic high altar of St. Peter’s Basilica in Rome is very different from the simple, plain table that you will find in the sanctuaries of many American Protestant churches. I suspect that most today are more comfortable with a table than with an altar. An altar brings to mind grotesque images of wild savages in some remote jungle offering a bloody sacrifice of an animal on an altar to appease an angry god. We are much more comfortable with the image of a dining room table where the family gathers to share pleasant conversation and tasty food. However, when we built this worship space 10 years ago, we knew that we wanted more than just a table. We knew that what went on here was more than snacking and chatting. It looks like a table, but its sheer size signals that something large and important happens here. Even though it looks like a table, we still call it an altar. A pastor friend of mine tells a story about what happened one Sunday at his congregation’s celebration of communion. The congregation robustly sang the liturgy. The communion assistants had carefully placed on the altar the beautiful chalice and paten. The altar was draped in fine linens, all color coordinated to fit the season of the church year. The congregation was poised to celebrate this magnificent moment of worship. The pastor began reverently to speak the words of institution. Suddenly the service was interrupted by shriek of a little girl, “Yuk! Ewwwww! That is gross!” Everything stopped. The congregation was stunned. This little girl’s shriek had reminded them that as they gathered around this altar, they were involved in something much more dramatic than gathering around a table at a local restaurant. She had reminded them that they were about to eat and drink the body and blood of Jesus. Yecch! Gross! She had reminded them that this eating and drinking was more like slaughter of an animal than tea and crumpets in the afternoon with your friends. Sometime when you are at home sitting at the kitchen table with one of your children, as this question: “Where does that slice of bread on your plate come from?” You will probably get a variety of answers, none of which really tells the origin of that slice of bread. Your child might say, “From this plastic package.” “From the supermarket.” “Oh, I know, . . . the bakery!” Your child may have no clue about the harvesting of grain, grinding at the mill and baking in an oven. Like a slice of bread, there is so much in life that is just “given.” We accept them without thinking much about their origin. For example, I recently read an article that described just how difficult it is to get back to the origin of things. The author reported how once he was walking through the streets of a Spanish village at dusk, when he head the evening quiet shattered by the sound of a horrible scream. Was a child hurt? Had an animal been injured? Was someone robbed? No! There on the back porch of a simple stucco house, an old woman was calmly wringing a chicken’s neck. It was time for dinner and she was preparing the family’s evening meal. In a short time, it would be ready to eat on her family’s table. Compare her children who were standing in the doorway watching this bloody slaughter . . . with our children who think that their fried chicken comes from Colonel Sanders. There is something to be said for the mother who let her children see the real origin of their evening meal. Our technological society insulates from the truth of so much of life. We take so much for granted. We forget that the conveniences and pleasures of life are the result of a long line of suffering and pain. It is not easy to live with the constant awareness of such misery staring us in the face. So we carefully conceal it in plastic and cellophane, brightly colored wrappers and cardboard packaging. That way we are insulated from all the suffering that went into our food. Perhaps that is why so many modern Christians build their churches around a table instead of an altar. A table is so much more “friendly.” At the dinner table there is good food and pleasant conversation. However, at the altar we hear the cries of death. We are reminded that this is a place of death. The shedding of someone’s blood and taking of someone’s life is the origin of this meal. We gather around this altar today not just because we like each other’s company (although I hope that we do!). We gather because we cannot forget the blood and the death that this important object recalls. It was the death, not the just of another beast, not just of another man, . 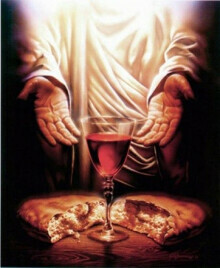 . . but of the Son of God, Jesus of Nazareth, that is at the center of this meal. What a strange lot we Christians are. We gather to worship our God gathered NOT around a garden of flowers, not under the sunny blue sky, not in view of a towering majestic mountain. No. We gather around a place that calls our attention to a life that was taken. We wonder what kind of God this is who invites us to meet Him at a place like this. After Jesus miraculously multiplied those few loaves and fish and fed a huge crowd, he started talking, not about feeding the masses with more of the same, but about that face that he was the bread of life. He invited them to eat his body and drink his blood so that they could live forever. No one or nothing else could give them life like him. For some it sounded like some grotesque form of cannibalism. For others it just sounded crazy. Who was Jesus to think that he was better than the manna God had provided the children of Israel in the wilderness? However, we have the advantage of hindsight. We know what lies ahead. We know that the blood and death are coming. Jesus was going to be betrayed by one of his own disciples. Jesus was going to be slaughtered like a sacrificial beast upon the altar of the cross. Why? Why was such a bloody fate necessary for the Son of God? The answer we often utter much too conveniently and matter of factly. The answer reveals a truth we so often want to ignore. He died because of us. He died because he came to bear our sin, the sin of the world. There, . . . I said it so easily, didn’t I. But like the chicken we conveniently pop into our mouths at the colonel’s, we don’t realize all the brutal blood letting it took to get it there. Jesus died because that is what it takes to love sinners and scoundrels like us. Jesus died because he became entangled in the maze of lies, fears, worries, hatreds and sins that make up the fabric of human life. Jesus died because we all must die. No one likes to admit that our world is so flawed, so fallen and so doomed. But if the Son of God was to become like us in every way, if God was to love us fully and completely, then Jesus had to suffer such a fate. That is what love does. God would have it no other way. oweverHowever, for all of its horror and carnage, this altar and the death it symbolizes is also a place of refuge and safety. Indianapolis’ most famous novelist, Kurt Vonnegut, in his book Slaughterhouse Five, tells the story of a group of allied soldiers who were captured and herded into a defunct meatpacking plant near Dresden, Germany in the closing months of World War II. It is called “Slaughter House Five.” Vonnegut vividly describes how the prisoners dread going into the dark basements of a place they could only associate with death. However, once they were in the slaughterhouse, it no longer seemed so cold and inhospitable. Sheltered deep in the basements of Slaughterhouse No. 5, when the fire-bombing of Dresden began, this house of death ironically becomes a place of refuge and shelter. The city above them is incinerated. However, sheltered deep beneath the firestorm above, this place of death has become a place of life. Can we not say the same about this altar? We are repelled by a place that reminds us of blood and death. On altars lives are taken. It was because of our sin that such bloodletting was necessary. But at the same time we are attracted to his place, because it reminds us of the love that was willing to give up all for us. The sacrifice has been accomplished. The judgment of God has been silenced. Christ is risen from the dead. So, let us come to eat his body and drink his blood and receive the love that not even death could end. Many that day walked away from Jesus. Promises like this are too much to believe. When Jesus asked Peter if he was going to join them, Peter responded with some of the most famous words in all of Scripture. They continue to be a part of our worship today. Perhaps you recognize them. God grant that Peter’s words would be ours as we come feast on the life that only Jesus can give.